The original Peter Rabbit tale was first published in 1902 by Beatrix Potter and has since sold more than 45 million copies worldwide! It would seem that no childhood is complete without an encounter with the world’s most famous bunny in a blue jacket. Now little ones can spend every day with Peter and his siblings, Flopsy, Mopsy and Cottontail (though hopefully not Mr McGregor!) 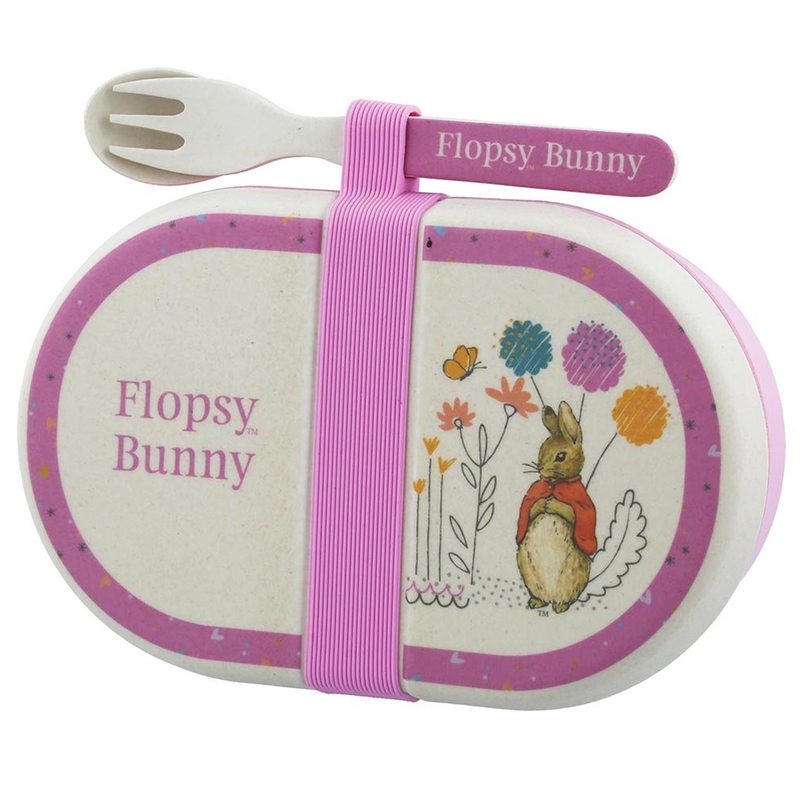 during meal times with this adorable Organic Snack Box with Cutlery Set. Made from organic bamboo, this cute snack box is the perfect size for a sandwich or a healthy fruit snack. It’s portable enough to take on a day trip or even to play school as the pink elastic fastening means the food stays safe inside. The box is also versatile. Use it later as a storage case for crayons or maybe miniature bunnies. Best of all, the artwork for this adorable snack box is taken from the original illustrations in the Beatrix Potter series. It features Flopsy in a field of flowers wearing her hot pink jacket. Suitable for children from 18 months of age. Presented in a Peter Rabbit cut-out box. Avoid use with liquid foods as the snack box lid is not leak proof. 18cm (l) x 7cm (h) x snack box.